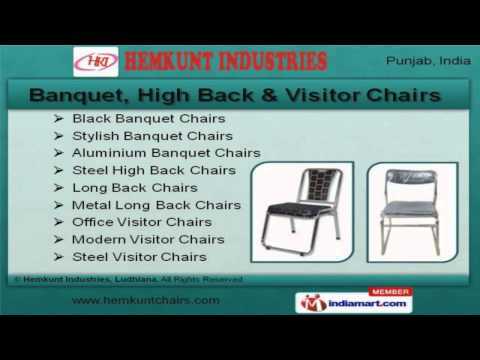 Welcome to Hemkunt Industries, Manufacturer and Exporter of Banquet Chairs and Wedding Sofas. The company was established in 2005, at Ludhiana. Our Total quality management and Wide distribution network help us to achieve an unrivalled position in the industry. International quality standards, On time delivery schedules and Maximum customer satisfaction make us the preferred supplier in the industry. We are offering top notch quality range of Restaurant Chairs, Banquet Tables and Two Seater Sofas. Banquet, High Back and Visitor Chairs offered by us are in huge demand across the global markets. Restaurant Chairs and Banquet Tables offered by us are extremely reliable. Our Sleeve Chairs and Wedding Sofas are best in the industry amongst others. We also provide Two Seater Sofas that are available in various elegant designs. Along with that we offer Steel Visitor Chairs for Hotels that are available at industry leading prices.